Sarah came and stayed at my place Sunday night. Monday it was the two of us plus Rose in my car going down to Santa Clara. Jane and Joe and Jack came down. Mary was already there since Saturday. Teresa was there until about 2 when she had to go to work. Julian and Lisa came down but they were sick and didn’t stay long. My headache never went away, despite some rather frenzied applications of medicine: ibuprofen, excedrin. maxalt – nothing worked. The next day I was torched. I stayed in bed pretty much all day and night. The headaches were under control but I was extremely tired. I did check my temperature but there was no fever. Wednesday I was going to go back down to Santa Clara and stay overnight but I knew I couldn’t do that nor did I want to expose Mom and Dad. Jane called me and said she would drive me down just for a couple of hours. It was Dad’s birthday. 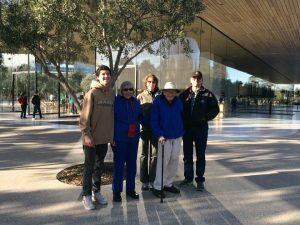 Jane got him to agree to walk over to the new visitor center at ‘Apple Park’. That was nice. the weather was perfect.Cool but sunny. Yesterday I felt better and got out to do some grocery shopping. In the afternoon, I went to take a nap but actually felt pretty good so I got up. I still went to bed about 7 as I had every other night starting Tuesday. By now the fatigue wasn’t so bad but the constant stuffiness in my head along with the coughing and runny nose. I take Afrin at night so I can breathe but try really hard not to take any decongestant during the daylight hours. Sometimes I think the Afrin works a little too well, creating a direct path for the cold air to blast through my sinuses to the back of my throat, where there is a tender spot from the post nasal drip. Well, today I went to work and did ok. Luckily just an 8 hour day and no one was in the building but Tim W and me. Tim put up with my sniffles. I didn’t get too close. Now it’s almost 8 and I’m heading to bed. One last thing. 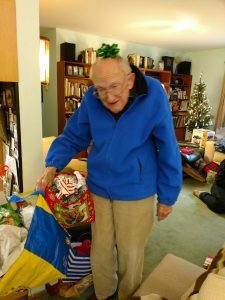 Mary got this picture of Dad on Christmas Day as he was taking all the torn up wrapping paper out to recycling. He’s still got his sense of humor! I had my long-awaited annual physical today. Long awaited because I had a bunch of questions that I’ve been holding on to for several months now. None of them were critical enough to call the doc but they were nagging. No, I’m not going to say what they were except that one was about the headaches. Dr Amara did not seem worried about my recent spate of headaches. She re-upped my Maxalt prescription without a peep. She ran down the results from my blood work. No surprises. My cholesterol is a little high but my Vitamin D and my Iron are back in the ok range (I’ve been taking supplements). My PSA is low. I’ve lost a little weight since last year but I could lose ten more pounds. And get more exercise . . .
She referred me to a specialist a couple of years ago about my blood counts which have been low. That specialist is out of town this week and I haven’t seen that part of the test results. Sometimes I think the headaches are more situational. If I’m busy at work it’s less of a problem. If I’m sitting around at home or not too busy at work, I feel that’s when the afternoon headaches creep in. Was I subconsciously worrying about this physical all last week? Or about Sarah being in New York? Or . . ?? I just can’t think of anything obvious. 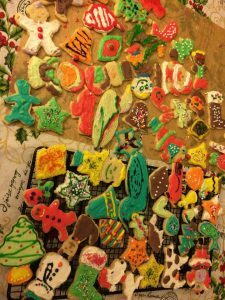 I know I think about writing in this blog a lot and yet I don’t do it very often. There’s some guilt there on slow afternoons. The last few weeks it seems that most of the posts I’ve done are often forced and not as good as I’d like. I put ’em out there because I want to put something out. I have to accept the fact that this is a blog about feelings and I write about the feelings I have at that moment. Maybe after I do this for ten years or so I can edit it all down to a nice book. Sort of like the guitar solos we hear on records. They sound fresh and improvised but almost always are a result of much trial and error and practice. SoundBox starts tomorrow for our last go ’round until December at the earliest. I had a meeting with the curator a week ago and hopefully there will be no technical surprises this week. I’ve gotten headaches for a long time. Not just garden variety headaches, whatever those are, but really nasty headaches. Despite the fact that these headaches have been serious, I’ve never been comfortable with the idea that they were migraines. I was usually able to control them with ibuprofen. I never had to go to a darkened room for three days or anything like that. There were difficult times, to be sure, but mostly I soldiered on. I remember keeping track of my aspirin and ibuprofen for a while during my Opera days in the ’80’s. Somewhere in a box there is a calendar with those notes. Thinking about this post this morning, I remembered a particularly nasty one that had to be in 1977. Eventually I stopped using aspirin and took ibuprofen only. It worked sometimes. I was never a coffee drinker but I knew about caffeine. What I didn’t know was the effect it had on headaches. It wasn’t until I was talking to my doctor in Grass Valley sometime in the mid-90s that I found out how caffeine could stop my headaches. What a revelation that was! That was good for a long time. I had to be careful not to take Excedrin, my drug of choice containing caffeine, for the nasty headaches, too late in the afternoon or I wouldn’t be able to get to sleep. Nor could I take it in the middle of the night unless I was prepared to stay awake. About two years ago, I was talking to my doctor here about my nighttime headaches during my annual physical. When I told her about the efficacy of caffeine, she immediately said, ‘Migraines!’ She gave me a prescription – Maxalt – that has been helpful for the times when caffeine is contraindicated. There are basically two times of the day when the bad headaches show up. One is in the night, usually waking me up in the wee hours, one or two in the morning. My strategy had been to take ibuprofen and hope for a couple of hours more sleep to get me to 5 or 6 am when I could take Excedrin. Now I can take the Maxalt and (usually) sleep better. I always felt these headaches were due to some kind of reaction to food. Maybe some kind of spice as they often came after a dinner of Mexican food. They didn’t always come after such a dinner, though. I couldn’t pin it down. I didn’t stop eating Mexican food, either. The other type usually started coming on in the middle part of the day. These I believe are tension headaches. I can sometimes identify what is contributing to it and try to deal with the source, as it were. Sometimes . . . This is my subject today because I’ve had headaches now in the early morning for the last 5 days. It seems unlikely that food is causing them. My diet isn’t great but I haven’t been eating particularly spicy foods. I’ve taken Excedrin at variously 4, 5 or 6 am but it hasn’t knocked the headache out. I’ve had to take the Maxalt at around 8 and a couple of days that didn’t even work. I suspect an element of tension. I have my annual physical scheduled for two weeks from yesterday so I will definitely be discussing this with Dr Amara. I have some theories about what is causing the headaches this week but that will have to wait for another post. One more day of work today then a couple of days off.